This is just too funny to pass off. I got this from the forums of PinoyExchange.com. I introduced the link to my officemates and, sure enough, mayhem ensued. 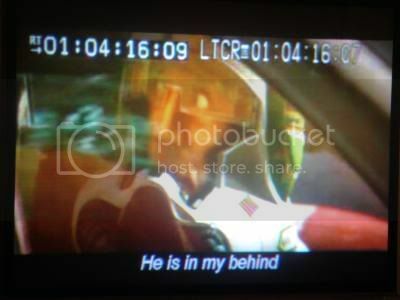 The pirated version of the Star Wars Episode III: The Revenge of the Sith comes not only in 'grainy pixel-vision' but with Chinese english translations. I will not go any further..Click on the link. Props to SoliduS_AlphA of PinoyExchange.com. BTW, you've been tagged. You're it! Answer the Qs or suffer 7 dog years and 13 seconds of bad luck. I wonder if there's KY Jelly in Tattooine? meatmarket: Thanks for the comment. I'm beri rucky to have flends rike you. tobie: That's good to know. I hate those timecode displays. What pirates do nowadays is they block them with a black strip above and below the screen to give it the "widescreen effect". Of course you lose a lot of the picture with it. Let's trade links!